In a segment titled TELL ME MORE, Michel Martin of NPR News recently conducted an interview with Michel Bolinder of the group Anacostia Riverkeeper and Nick Gillespie, the editor-in-chief of the libertarian magazine, Reason. These gentlemen sat down together to discuss the pros and cons of fees or taxes levied against disposable plastic bags and outright bans on these disposable bags, as well as the environmental and societal impact of measures taken to curb plastic bag use. Critics argue that taxes and bans are just too much interference on the part of the government. People should be free to carry their purchases home from the store in whatever vessel of their choosing and the government, whether town, city, regional or state have no business getting involved. This concept is great and there are certainly times it is applicable. It would also be wonderful if everyone made the decision to implement a personal ban on disposable plastic bags and make the switch to bags made with eco-friendly reusable material; however, that has yet to happen so maybe laws mandating bans that completely stop plastic bag use or fees the severely diminish disposable bag use is the best option. People have nothing but opportunity to properly dispose of plastic bags and it does not happen. Fees and laws may sound extreme, but they get results when other measures do not. One anti ban and fee argument is that bans and fees are on par with the lifestyle of middle class Americans so it is not fair to impose these measures on lower income individuals. Essentially since middle class folks drive everyplace they need to go they can easily store their reusable bags in their cars or minivans so when they stop at the store they are prepared. This demographic is also in a better financial situation so spending the money, or splurging, on reusable bags is not as difficult for them as it would be for others. Environmentally friendly recycled bags are purposefully priced to be inexpensive. While some municipalities use the monies raised to finance cleanup efforts or education programs, fees are never intended to be a great money making venture. If a shopper who lived in an area with a tax opted to pay the money for each plastic bag they used they would spend about $15–$20 annually. For some budgets this may be a difficult expense to justify, but most reusable bags cost anywhere from 99 cents to $3, and they are designed to last for several years. 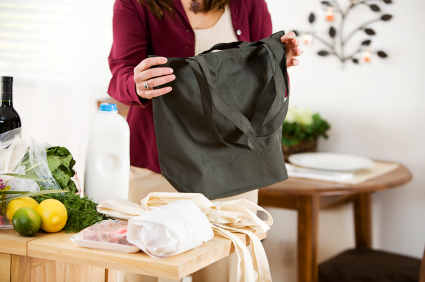 Reusable bags pay for themselves in a few months and are the more cost effective option. It is also worth noting that many bans have stipulations to accommodate low income individuals and different organizations and stores oftentimes hand out fee reusable bags to help out. Statistics can be tricky. Groups that are pro banning plastic bags are quick to pull out the facts and figures stating what percentage plastic bags make up of litter picked up in various municipalities, as well as the before and after comparison stats when a ban is put into action. On the other hand, groups against ban do the same – they claim plastic bags make up a lower percentage of the total litter and that after bans are put into effect there is the same amount of litter on the street as there was before. All of this contradictory data can be confusing and is enough to make anyone’s head spin. It can be easy to spin the numbers to put an argument in a favorable light, but do not let this fact devalue the merit of the data. Everyone agrees that plastic bags are not good for the environment – it is the degree to which they are bad for the environment that causes a divide. If plastic bags were not a serious threat to the environment and to the quality of our oceans, and the air and soil why would the government care? Why would any effort to charge a fee or implement a ban pick up steam, let alone be passed into law? It is hard to argue that there is not harm when animal carcasses with pieces of plastic bags entangled inside are found on beaches and riverbeds. The TELL ME MORE interview delves deeper into the issues that surround bans and fees and gives both sides an opportunity to explain their stance. Increasing the use of reusable shopping bags will decrease the use of disposable plastic bags and in turn reduce litter. The issue is not about government interfering, but more about taking care of the environment and keeping our homes and communities clean. To read a transcript of this interview head over to http://www.npr.org/2012/06/05/154354092/do-plastic-bags-bans-help-the-environment.